Ladies, gents, let us introduce you to Corsair's latest mid-tower chassis, the Graphite Series 230T. Priced at around £60 and launched as only the second member of the Graphite Series line, the 230T faces the arduous task of following in the footsteps of 2010's award-winning 600T. And that's no small challenge - the 600T may be a little old in the tooth, but it still looks fantastic and, here in HEXUS HQ, it is still our preferred test-bench enclosure simply because of the excellent quick-release side panels. Anyone seeking 600T-matching levels of goodness should keep their expectations in check. In order to reduce the price point by as much as 60 per cent, the 230T is a smaller, more modest affair, measuring 440mm (H) x 210mm (W) x 550mm (L) in size. 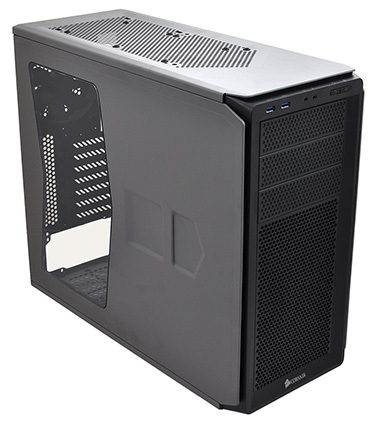 The good news, however, is that Corsair has continued to give the Graphite Series range a decent amount of flair. The 600T looked like a chassis designed specifically with Storm Troopers in mind, and though the 230T isn't quite as fancy, it retains a modern appearance that, in person, is actually rather cool. The 230T's top and side panels provide a lip that surrounds the front fascia, making it appear as though the chassis has an extra protective layer. Making good use of the design, the front I/O panel - consisting of dual USB 3.0 ports, audio jacks and power and reset buttons - is spread across the front, with labels neatly tucked along the top edge. Corsair's attention to detail elsewhere doesn't go amiss, either. 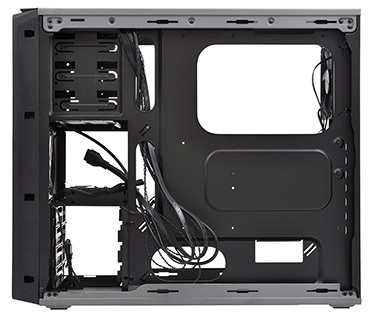 We like the fact that the front optical-bay covers are dimpled so as to maintain the appearance of the mesh section below, and regardless of what you install on the inside, the arrow-like elements around the sides will make sure your rig at least looks fast. 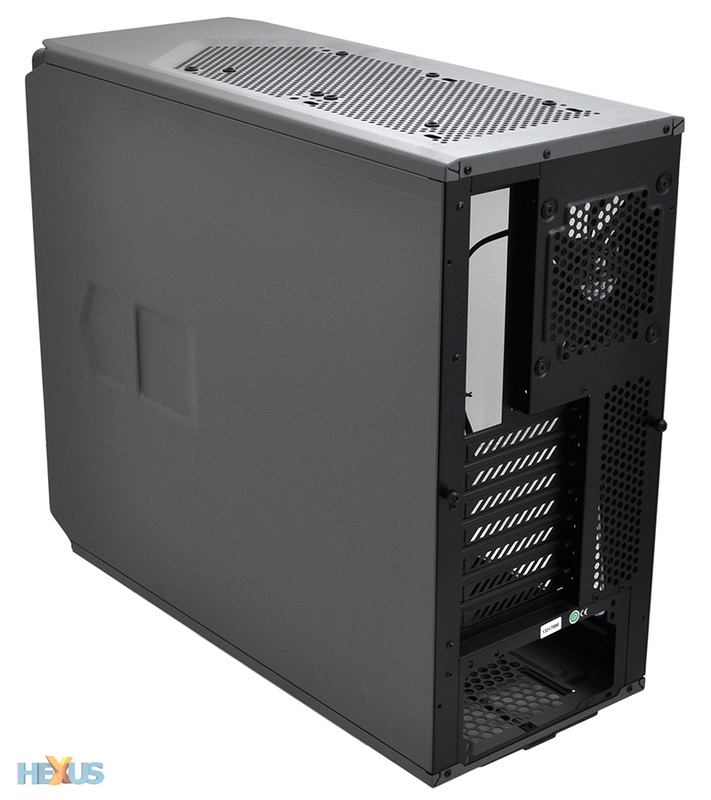 From an aesthetics point of view, this is one of the more stylish mid-tower enclosures available today. Corsair has managed to give the 230T a fresh look without overdoing it, and for those who want to stand out from the crowd, there are colour choices available, too. Our review sample is Battleship Grey, but Black and Rebel Orange are also on offer. The latter looks particularly interesting, and it's worth noting that Corsair has colour-coordinated the front fans, as well. The three models ship with blue, red, and orange LED fans, respectively, providing would-be buyers with plenty of variation. Though, the colours won't be to everybody's liking. Sat behind a plastic front layer of mesh, we found the blue LED fans a bit too bright for our liking, and we'd have preferred a) white LEDs and b) an option to turn the illumination off. 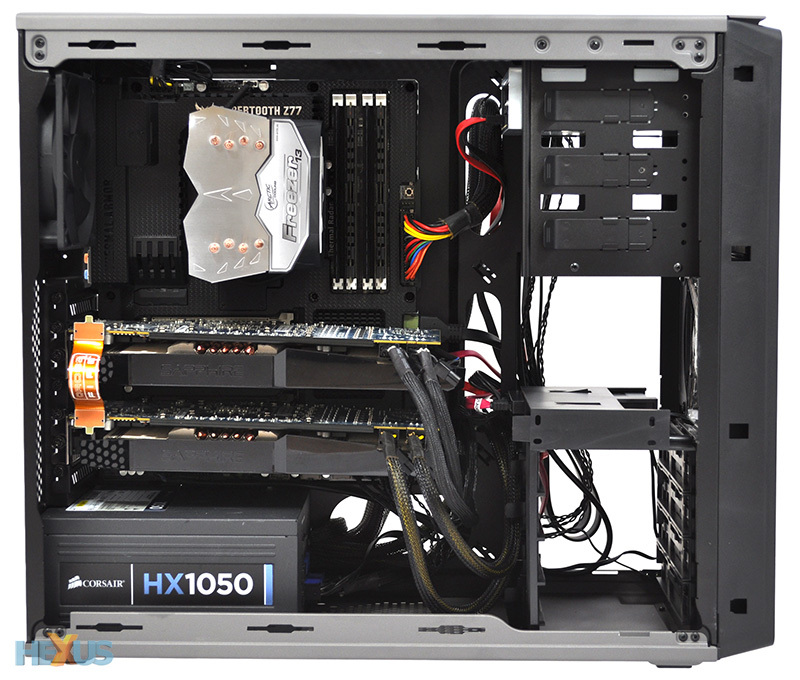 Still, the colour options are a good thing, and Corsair's build quality is, as expected, of a high standard. Both the steel frame and the plastic accents feel well-put together, the interior is matte black throughout, and the external lick of paint even extends to the underside of the chassis. The 230T is certainly attractive, but there is one obvious drawback: it doesn't have the quick-release side panels available to its premium 600T sibling. And, not only that, the side panels the 230T does have are, well, rather weird. For reasons we can't quite work out, the chassis' side panels slide open to the front. The reversal is quirky to begin with, but once the novelty wears off, you soon become tired of having to remember which way to pull. And it isn't a convenience thing, either, as each panel's solitary thumbscrew remains around back. With the side panels off, you get a sense of deja vu as Corsair's new Graphite looks and feels familiar. There's a reason for that - the 230T is based heavily on the underpinnings of the entry-level Carbide Series 200R. It's on the inside that the gulf in class between 600T and 230T becomes evident. What we have here is ultimately a Carbide Series frame living in a Graphite Series skin. Though, that might be a bit of an injustice, as there are a couple of key alterations. First and foremost, the 230T's mesh front panel should improve the chassis' airflow, and building on that line of thinking, there's an extra front intake thrown into the mix. Whereas the Carbide 200R shipped with a single front intake, the Graphite 230T carries dual front intakes allied to the customary rear exhaust. 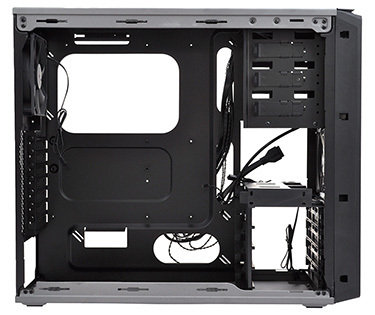 The improved setup should result in better out-the-box cooling performance, though as you'd expect from a Corsair chassis, there are provisions for user upgrades. 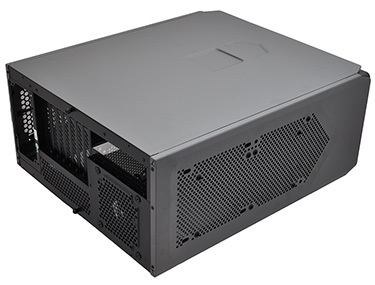 A further 120/140mm fan can be added to the base of the chassis, alongside the bottom-mounted PSU, and a pair of 120/140mm mounts are available in the ceiling. That's six fan mounts in total, so air-cooling support is plentiful, but we suspect it'll be a real challenge trying to squeeze in a 240mm liquid-cooled radiator. Knowing that air-cooling is the Graphite 230T's forte, it's a shame Corsair hasn't provided additional filters. 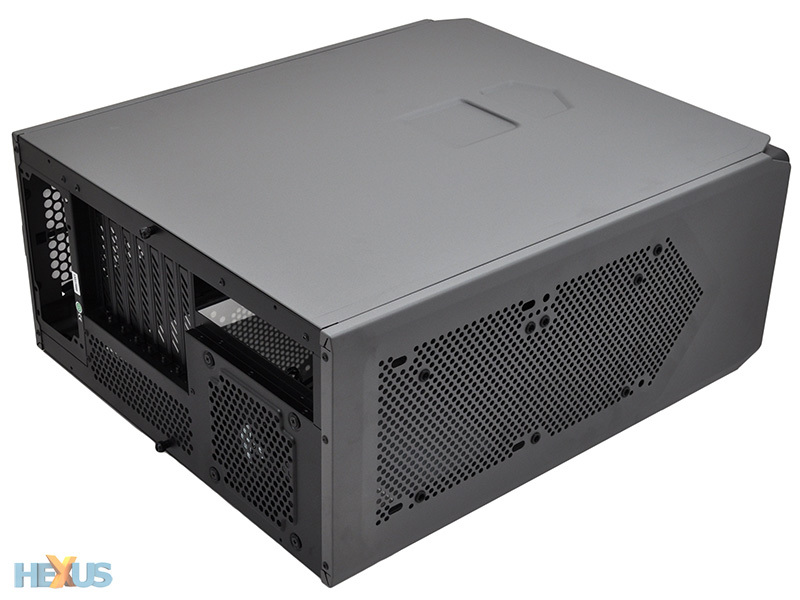 In keeping with the 200R, a pull-out filter is positioned beneath the PSU bay, but the bottom and top fan mounts are left unprotected. Given the chassis' eye-catching exterior, we were hoping for an interior full of intrigue and extra features. This, sadly, isn't the case (excuse the pun). There's no integrated fan controller - a la the Graphite 600T - and, from a build perspective, everything's practically identical to the cheap-and-cheerful Carbide 200R. That means a trio of optical bays, a fixed plastic hard-disk cage offering support for four 3.5in drives, and four side-loading 2.5in SSD mounts. The short, tool-free storage stack leaves the upper front intake with a clear path for airflow, but the column isn't modular so there'll be no rearranging. We'd have liked to have been able to attach the SSD mounts to the bottom of the optical bays (preferably rotated 90º to face the back) and remove the hard-disk cage entirely, but that isn't an option. Elsewhere, everything is fairly standard for a budget chassis. Seven thumb-screwed expansion slots are available, with support for graphics cards measuring up to 430mm in the top slots, though as a result of the fixed hard-disk cage, maximum GPU length in the lower slots is reduced to 320mm. Worth knowing, but there's still plenty of room for our dual Radeon HD 7950s. 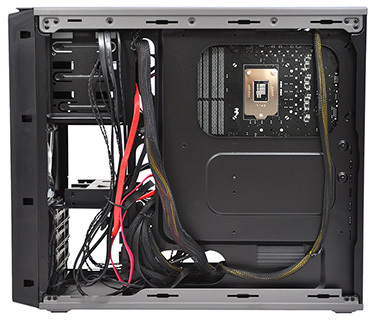 Cable-routing possibilities are plentiful, with a good number of tie-down points on the rear of the motherboard tray, yet none of the holes are rubber-grommeted, meaning cable clutter isn't hidden as well as it might have been. 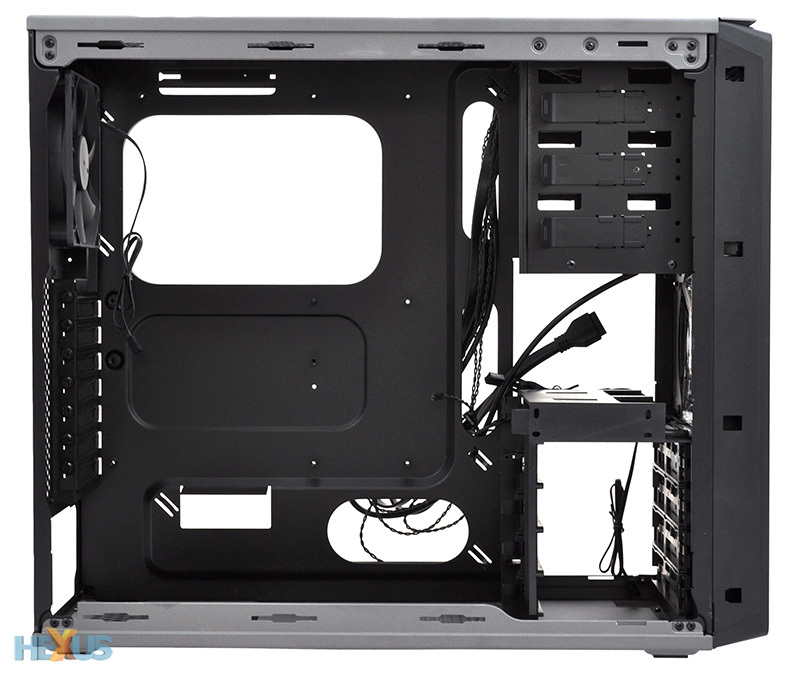 Our dual-GPU setup is such that attaching the rear side panel can be a sticking point in budget chassis, but we had no problem in the Graphite 230T - there's adequate room for excess cables, and the side panel slid into place with relative ease (albeit from the wrong direction). On the whole, this is a capable mid-tower chassis that does the basics without pushing the boat out. Trouble is, with the Carbide 200R now available for as little as £47, is the dolled-up Graphite 230T worth the extra? Well, that depends. Corsair has a black, windowless version available for £57, and you could argue that the aesthetic makeover, extra fan and mesh-aided airflow is enough to warrant the £10 premium. 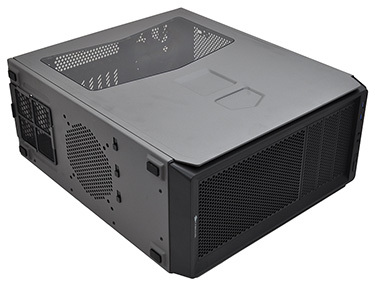 That argument holds less weight when the windowed models come into play - they're £67 a pop, putting them into direct competition with the likes of NZXT's H230, Fractal Design's Define R3, and Corsair's own Carbide Series 300R.